I am writing this review after seeing the first episode of In Another World With My Smartphone and right now I am definitely looking forward to seeing more of this story unfold. The atmosphere of IAWWMS is very relaxed. The art/style and development of the characters and settings adds to that atmosphere right from the delivery of the first lines, "I'm very sorry about this, but you're dead. I made a bit of a blunder and dropped lightning on the world below." The MC, Touya, takes this statement in stride. At least in this episode Touya seems like he carefully assesses situations and takes care of issues/conflict reasonably. It is a bit of a breath of fresh air considering the overeactions and exaggerations in some resurection in a fantasy world shows (which, don't get me wrong, I enjoy too). I also like that the MC and his party have the potential to be extremely overpowered. Just in the first episode they work together to defeat "thieves," clear a monster quest, introduce the worlds magic, guild & monetary systems and help a restaurant owner. The only over the top character so far seems to be a clothing shop owner who serves his purpose well. Reasonable, strong characters who are working to improve the world that they live in one used outfit and bowl of ice cream at a time. What's not to like? A main character who made a smart choice with God! First episode of this series start off and similar to KonoSuba. Except he not unless and he did not pick the bad choice. But made the smart choice by asking God to bring his smartphone to other world and also god gave him the ability to use magic and basic knowledge of swordplay & martial arts as gift for accidentally killing him. (SPOILER) Finally how he meets first set characters is similar to Re: Zero except he doesn't die over and over and I can say this first episode of this series start off great and can't wait to see what happen next. What I wanted from Re:zero. Edit: People need to chill with the copycat remarks. I loved Re:Zero but I have never been a fan of watching anime with quite a lot of in depth violence in them but I do love the type of setting these two shows are based in and I honestly prefer light and cheery over gloom and doom for every episode so this for me a better alternative if you like magical world settings but not a fan of doom and gloom. Just a quick edit to say that yeah I compared it to Re:Zero but I dont think its such a bad thing to have a similar premise to another anime and I dont understand why people think that its such a bad thing just look at SAO and Log horizon and Overlord all three are anime which involves the player being stuck inside of a game and yet all three are great anime's so instead of writing it off as a copy cat just give the show the chance thats the least people can do. Another reborn in another world anime..
Mary Sue MC + Konosuba (reincarnation) x No Game No Life (smartphone) - nuff said. 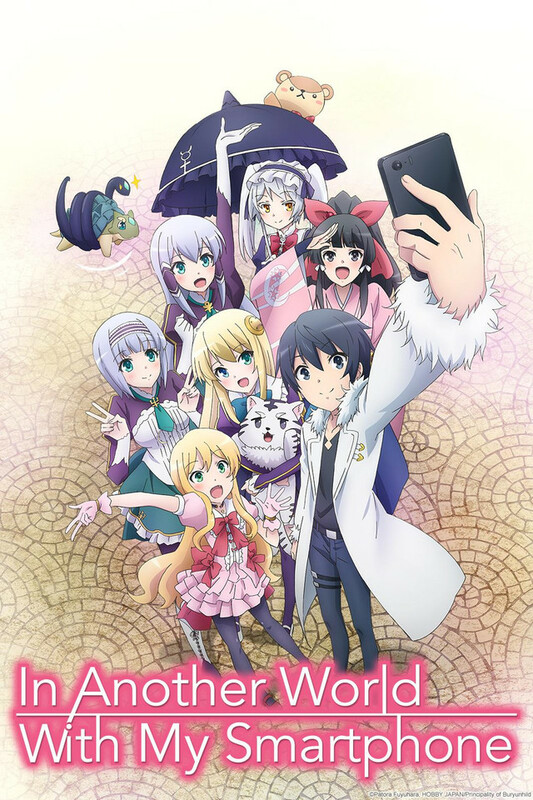 Will give it the obligatory 3 episode watch but this reborn in another world genre is getting ridiculous. A little fast paced but that could be viewed as a plus. It's very enjoyable and can't wait for the next episode! If you like re:zero you will really enjoy this, art style is great and so far the MC is turning out to be op as usual but I like it when they are and the outfits with the girls is great too, not too much but enough to enjoy. very chill light novel. after first 2 episodes it's not that good of a adaptation. edit: after 11 eps of watching. it's not as bad as i made it out to be. i just really prefer the read material for this type of series i guess. it got better around episode 3-5 or somewhere. hell it's a series that can't be explained why you like it. no stakes in ANYTHING AT ALL. which is nice if you just want to chill and read... or watch in this case. Read up to vol. 3 of the light novel. normally hate stuff where the main character is crazy op. but this one i like for some reason. I just look at him as a red mage from Final Fantasy 11. (permanent regen of mana, can use up to a certain spells and sword skills of everything. cannot use advanced spells or sword play). but the light novels had a charm where there was zero tension on if the character will survive in the world and how much pain he'll go through to get anywhere in that world. the LNs just followed his life in this new world. for an isekai series it's just fun. so avoid this series if you hate the following... if you don't like over powered characters, don't touch this anime. once he has use of his smart phone with magic don't expect him to be hurt easily. also don't watch this if you hate harem anime. edit: I watched the first two episodes and it feels... to fast paced and the world building is not there. which to me, was a huge point of the light novel. events are done out of order (not really a problem for most people.) also, the animation is not very good... I recommend the light novel instead of the anime. also if you didn't know the author writes the entire series on his smartphone. which i believe is the reason he made it about a smartphone. Okay, I can't help but see this as a slice of life version of Re Zero, but far more anti climatic. The MC is a Gary Stu, nothing interesting happens, and you can see a mile away how things will progress. At episode one, I'm giving it one star for the perceived lack of effort, and will update as the story unfolds. I don't expect much, but three episodes is the standard for judgement, so we'll see. It got worse, now the MC has gotten a weird Jesus-kun vibe going on, and it's just groan inducing. They added a warrior girl that knows martial arts and all she does is praise him. As I mentioned before, the guy's a Gary Stu. All of the fans who down voted need to just admit this show is awful. Kirito, moved to Re:Zero through Konosuba; And it's worse than all of them. The story starts with basically the same premise as Konosuba. And by pretty much, I mean it feels like the writer started by cloning Konosuba but changing just enough so it wasn't technically plagiarism. Then, after literally just getting free stuff for no real reason, the main character finds himself rescuing a couple of harem girls in an alley from a couple of guys with knives. Remind you of anything? How about a reverse of when Emilia saved Subaru in Life#1. Oh, and the the spoken language is Japanese while the written language is not, so if that first one didn't ring a bell, I hope that second part does. Let's not forget that Mr. Overpowered is also a goodie-two-shoes. It's like Kirito, but he didn't even do anything to get stuff. No endless grinding, no risking your life every other day, none of that stuff. For art, it's fine, but it's nothing special. P.S. : That's not how phones work. That's not even remotely close to how phones work. Unless that God is a hardware and software engineer, who knows the precise details of how every part of the internet and smartphones work (which I'm pretty sure applies to nobody), I'm having a hard time buying the entire premise of this series. P.P.S. : In order to access the internet, you need to send a number of requests to the host, but the only truly necessary one is a GET request. That request includes lots of details about the user, including but not limited to their IP address. In order to have a valid IP address, it would need to be cataloged in an RIR, which would need to be cataloged by IANA. This means there's so way that the God could actually disconnect the MC's online presence while still letting him use the internet. Lot's of potential to be good! While the anime has a very similar twist with the main character dieing and ending up in an another world the first episode seems to promise a bit of a change to the old formula. Our protagonist dies and as his 1 wish decides to take his smartphone to the other world. He can still access the internet and google things as if he was on Earth. I think it's a interesting premise with potential to be good and raises a lot of questions of how he will use that information in this new world. I look forward to watching this show! After watching the first episode, I find it to be light and entertaining. I could care less if it resembles similar anime series. While it may be some what predictable, thats okay. I will enjoy watching the balance of this series. It's entertainment, after all.